SMALL-SIDED games coaches across the country need to act fast to snap up the remaining places in this summer’s debuting DB Sports Tours Small Sided Games Tournament. Last month we announced in the Irish Daily Star’s amatuer soccer supplement Target that we were following up March’s successful Small-Sided Games Easter Cup in Manchester with a home-based tournament in August. The exciting new competition will be held at VEC Football Club in Terenure on Saturday August 3 and Sunday August 4. Encompassing four sections, Under-9s, Under-10s, Under-11s and Under-12s, the first two sections will be played at seven-a-side and the two older age-groups will be nine-a-side. The likes of St Francis FC, Peamount United, Shelbourne and North Dublin Schoolboy League selections took part in the Easter Cup and St Kevin’s Boys, Cambridge Boys, Naas AFC, Esker Celtic, Belvedere and Leixlip United are already signed up for the summer’s action. We are also proud to announce the biggest team to take part in the August competition alongside us will be Ireland’s premier club gear supplier ClubGearDirect, who are our new sportswear sponsor. Former Tottenham Hotspur star and League of Ireland legend Neale Fenn is the Dublin agent for ClubGearDirect’s Under Armour line and as the founder of the Just4Strikers academy he will be keeping a close eye on the talent. 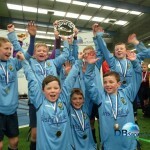 Facing the likes of Blackburn Rovers, Arsenal Soccer Schools and a host of semi-professional clubs from Manchester, the Irish youngsters more than held there own in March. DB Sports Tours managing director David Berber insists that impressive displays from Irish sides in Manchester convinced him a domestic competition was necessary. “If you seen the Irish teams competing against big-name professional and semi-professional clubs you would realize that small-sided games is a real strength of Irish football,” said Berber. “The players were more than able to compete with their peers from England and it was obvious that that is not where the problem with development lies. “Obviously it is somewhere between 12 and 16 that English kids with professional clubs are pulling away from Irish players – perhaps because of the advanced preperation and attention they get. For more information on how to get one of the limited places available in the tournament visit www.backmain.dbsportstours.com or email today.